I’ll start by saying I have a massive history with The Black Crowes going back 28 years and every guise of that band or solo project by its various members over the years have been watched in an almost religious fashion. More than a hundred times I have seen either Rich Robinson or Chris Robinson in concert and sadly since the brothers are not on speaking terms anymore, the chance of a reunion called ‘The Black Crowes’ is probably now only a distant fantasy. So, in the meantime we have a band called ‘The Magpie Salute’, Magpies are a member of the Crow bird family – clever eh? 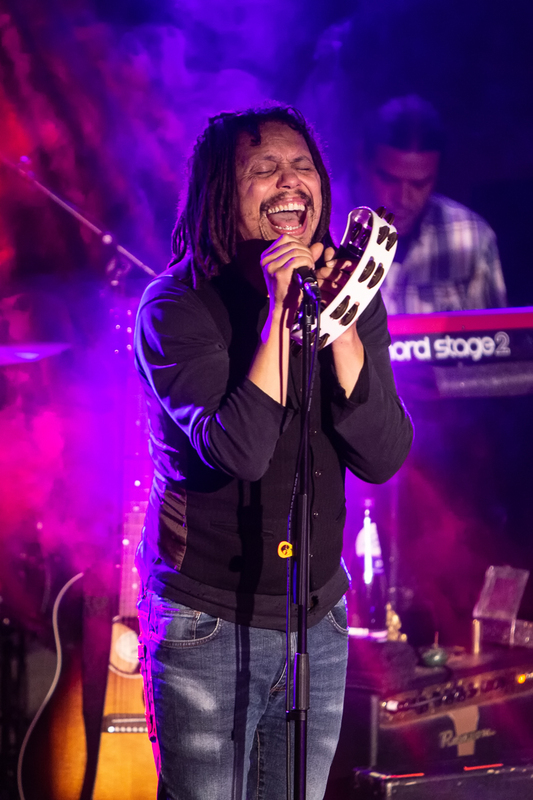 Not only that we have in the ranks of this fine band, founder Rich Robinson and former Black Crowes guitarist Marc Ford, and longtime live ‘Crowes’ bass player Sven Pipien. If you put those elements alongside Robinson’s solo band members Joe Magistro (drums) and Matt Slocum (Keys) and then add the incredible voice of John Hogg you probably have as close as you can get to The Black Crowes experience without enduring the mouthy front man antics and hippy dances of squawker Chris Robinson. In short, it doesn’t get much better, if you like your classic rock music with a Southern feel, a little bluesy, a bit of acoustic Americana and some extended rock guitar jamming that can take you to another place - then this is the band for you! The Mill is a new refurbed venue in Birmingham, it is practically perfect - a lowish stage and good viewpoints all around, and as the band take to the stage we have some old original bluesmen guiding them in to match the burning sage scent wafting over the first few rows. It isn’t sold out, but it is a reasonable turnout for Birmingham on a wet Sunday night in December. Opening with several new songs from their debut studio record ‘High Water I’ they set the scene with some extended open jamming, this happens a lot during the night. Rich Robinson always in control of proceedings as he looks across and nods to Marc Ford who then picks up the guitar solo baton in this long-distance epic. It isn’t a race though, or a type of fretwankery associated with an Yngwie Malmsteen or Joe Satriani, it is a delicate balance of blues-based jamming with light and shade in equal measures, passing from one to another Ford and Robinson weave a tapestry of intricate tunings and melody from a range of beautiful guitars. When they combine together it is a force to be reckoned with, and the sound here in Birmingham was good enough to pick out both leads without it feeling muddy. 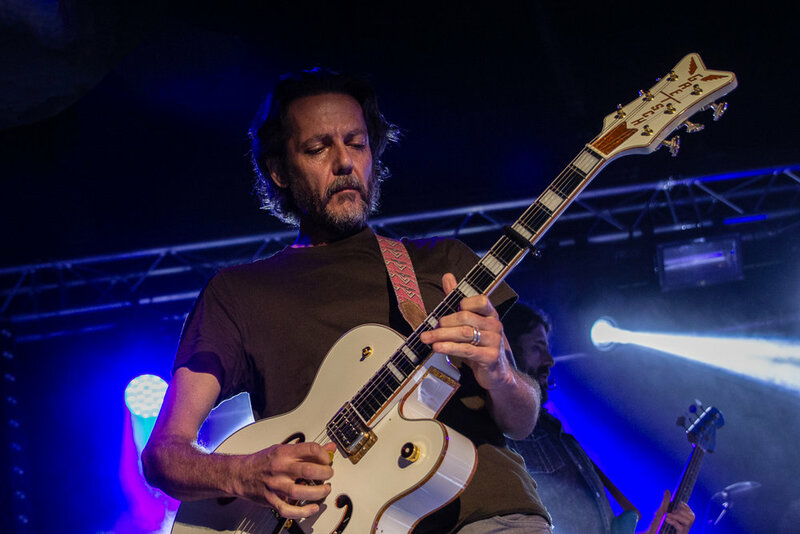 After a hefty opening of new songs from the album we have a handful of covers and a chance for Marc Ford to play one of his solo songs ‘I’m Free’ and Rich Robinson then taking a similar solo turn with ‘Standing on the Surface’. Whilst this band is made up of 2 heavyweights from the Guitar World, they have a mutual respect for each other’s talents and know that together on stage they are much stronger, the Marc Ford influence on 3 key albums (Southern Harmony, Amorica & 3 Snakes) in Black Crowes folklore is in evidence throughout tonight. Even on new songs like title track ‘High Water’ it feels like it could have been taken from any of those 3 records. John Hogg’s vocal range is much wider than Chris Robinson and his faint touches during the acoustic section of the evening were a huge contrast to the all rock out ‘No Speak No Slave’ and ‘Send Me An Omen’ encore. Interestingly Hogg did most of the speaking to the audience in-between songs which shows how far he has grown into an equal member of this band, and not just a replacement singer. It takes some balls to break up a rock n roll show with “We’d like to do some acoustic songs for you”. Miraculously it didn’t cause a stampede to the bar from the beardy long-haired crew here tonight, NO! they stood and watched in relative quietness as Ford and Robinson sandwiched Hogg (bacon butty anyone?) in front of a single mic and delivered a spellbinding session of lush acoustic blues with all the pathos, poise and sentiment intact. Culminating in ‘Non-Fiction’ a Crowes live classic, they very cleverly transcended from acoustic back to electric, swapping guitars in turn, welcoming back Pipien, Magistro and Slocum to the fold and upping the decibels x 10 in the process. Impressive to watch and great on the ears. The home straight had three absolute stunning Black Crowes songs including ‘Paint an Eight’ which was a rare live only track for some years, and then ‘No Speak No Slave’ which had a much-extended piece of rock and roll guitar heaven, frequent nods between all players before Robinson and Ford bring the track to a close with their duelling guitars moment. A very brief “Thank you for coming” and explanation of how they don’t go off, hide behind a curtain and then come back on for an encore – “You are in the encore now”. ‘Send Me an Omen’ is ringing in our ears all the way home with it’s “BaBaBaBaaah” chorus line. As the first gig of 6 that I am going to on this tour - it is going to take some beating, it had everything - old classics, new songs, light and softness of acoustic and then some dirty rock and roll blues. No Trouble at Mill tonight for The Magpie Salute!